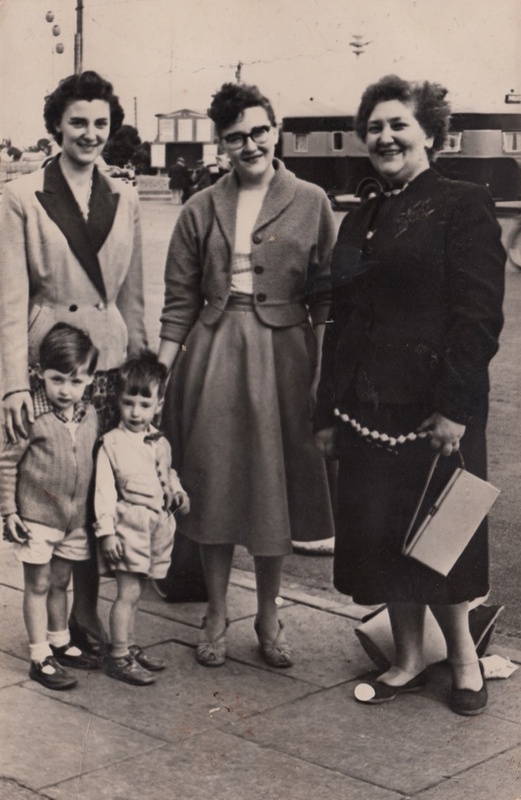 Apart from memorable excursions outside London as an evacuee, Marie Iles has lived her entire life within a quarter mile of Stepney and it suits her very well. 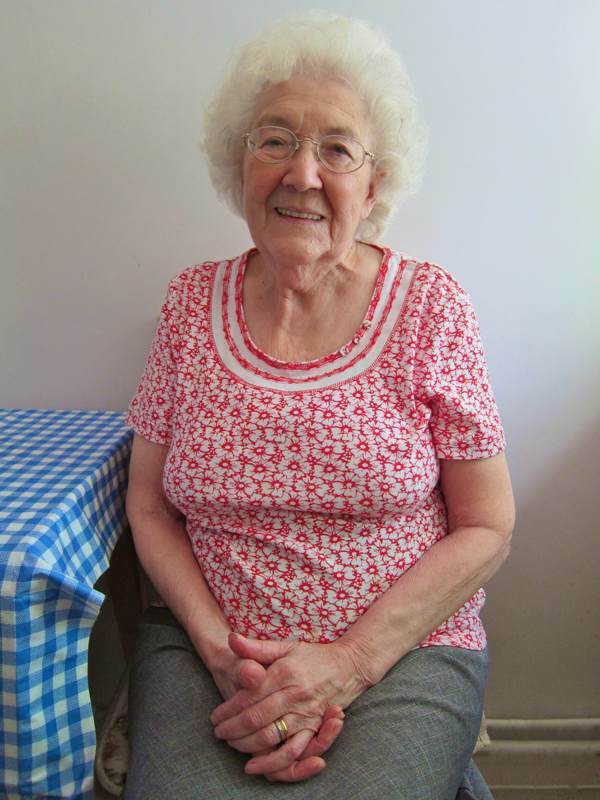 Those wartime experiences taught her the meaning and importance of home, yet living close to Stepney City Farm today she still enjoys a reminder of the rural world she grew to love as a child. A natural storyteller, Marie laid out the tale of her formative years for me with confidence and eloquent precision. Blessed with independent thought from an early age, Marie quickly learnt to stand up for herself and to appreciate the moral quality of people’s actions, whilst she was suffering enforced exile from her beloved Stepney amidst the tumultuous events of a world war. 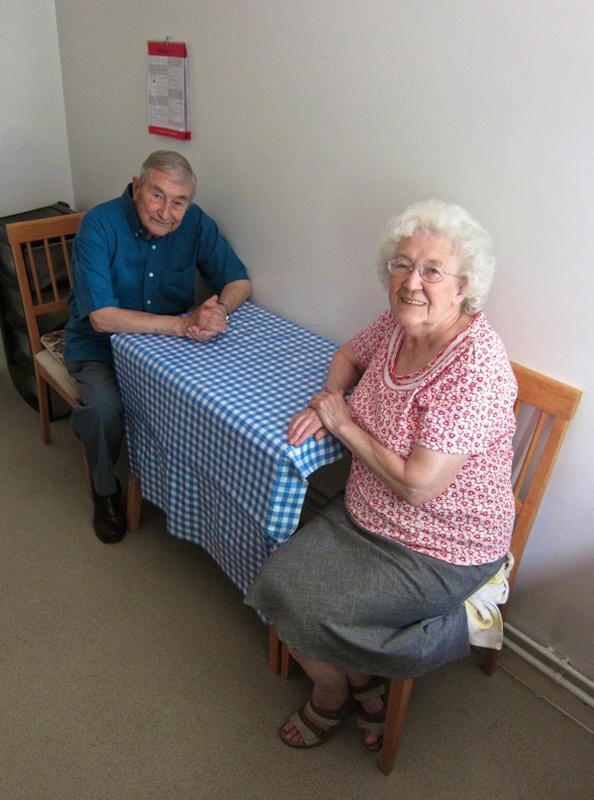 Recently Marie celebrated her Diamond Wedding Anniversary, and it was the meeting with her husband Fred Iles that provided the sympathetic resolution of her dislocated early years and resulted in an enduring relationship which has sustained them both for the last sixty years. “I was born on 9th August 1930 in Fair St, Stepney, while we were living upstairs in two rooms in my nan’s house, and when I was four or five we moved to Garden St. But I usually lived with my nan – whom everyone knew as Aunt Kit – because I loved her so much. I had a happy childhood playing in the streets, games like Hopscotch and Knocking Down Ginger. We was always running around and the police would pick us up and take us to Arbour Sq Police Station and give us bread and jam. The siren went when I was out shopping with my nan in the old street at the side of St Dunstan’s church and, all of a sudden, there was bombs dropping and aeroplanes. My nan said, ‘You run home to your mum quick,’ but I wouldn’t leave her. So she said, ‘Run!’ and I ran on the spot to show I was running. Eventually, we got home to Garden St and my mum, who had a phobia that she might be taken ill or die with dirty feet, was saying, ‘Get a bowl of water, I’ve got to wash my feet.’ When the bombing eased up, my nan said, “I’ll take the two girls home where there is an Anderson shelter,’ and, as we came out, it was a terrifying sight – where there had been houses, there was just piles of bricks and rubble, and there was a horrible smell of smoke and, that night, the sky was red with the light of the fires. We stayed at my nan’s a few weeks after that, until one day I was at my mother’s and she said, ‘You’re going on a holiday, you, Kitty and Johnny.’ We was excited! My mum pinned a label onto each of us with our name and address on it, and filled a carrier bag for each of us with our belongings. We went to school and there was a couple of coaches waiting, and my nan said, ‘Write to us and always say your prayers every night,’ and she put three sixpences in my hand. I thought, ‘I’ve got money and I’m going on holiday,’ and I was pleased. We all got on the coach together, me and Kitty and Johnny. Then, as we were going, I dropped my three sixpences in the excitement and it felt like the end of the world – not because of the money, but because my nan had given them to me. We arrived at what I later found out was Denham. We was dropped at the corner of the street, and ladies came over and picked who they fancied. Johnny went with a Mrs Burrell, a lovely little country lady with red cheeks. Kitty and me, we went with Mrs Rook. She had a nice house, that was what we would call ‘posh,’ and she had a grown up son and daughter, Ken and Joyce, and her husband Mr Rook. Yet I hated it, I was so homesick and cried every night for a fortnight but my sister loved it. I asked her, ‘Why don’t you get homesick?’ She said, ‘Because you are here. Wherever you are, I am alright.’ I was her elder sister. One morning, Mrs Rook said, ‘Why don’t you put on your coats and go out for a walk?’ And the first person we met was Mr Goddard, my headmaster from school in Stepney. He took hold of my hand and asked, ‘Have you got a nice place to stay?’ I said, ‘Yes, but I hate it I miss my home.’ So he said, ‘Look Marie, do you want me to tell your mother what you said and have her worrying about you?’ And I said, ‘ No, don’t tell her,’ and, after that, I was alright and I had a happy time. And that was when I first noticed flowers and the trees opening up. Once there was snow, and Mrs Rook sent me to Denham village for an errand, and I saw these flowers peeking up through the snow – crocuses – and I thought it was a little miracle, that flowers grew in the snow. Then it seemed the bombing stopped and they took us back to London, and we was there for a while until they sent us off again. They put us on a train at Paddington and we stopped overnight at an army barracks and slept on the floor, and me and Kitty cuddled up under a blanket. Other kids were crying but I wasn’t homesick. In the morning, the soldiers gave us breakfast of ham and hard-boiled eggs and tea and bread and jam. We travelled on and we came to this little village near Rugby called ‘Crick.’ A Mrs Watts picked us out and she lived in Cromwell Cottage, a nice house, and she gave us three meals a day but this lady had no compassion whatsoever. She took us because she didn’t want to do war work. She turned us out at seven-thirty to go to school, and she used to go to the pictures in Rugby twice each week and we had to wait outside in the bitter cold until she came home. Down at the bottom of the hill, lived an old lady and her husband – they must have been seventy. I went there and knocked on the door and asked, ‘Could you take two evacuees?’ She said, ‘Who are they?’ I said, ‘It’s my sister and me.’ She said, ‘Alright, take the old pram and go and get all your things.’ So we went back to Mrs Watts. I said, ‘I’m leaving, I’m going somewhere else to live.’ And her husband, Jack Watts – he was one of the kindest men I ever met – he said, ‘Marie, stop and think what you are doing.’ But I never did, and that night we went down to the old lady and the old man. Talk about ‘out of the frying pan into the fire’! She never cooked, she just gave us a bit of toast sometimes. Then she decided to visit her son and daughter for a holiday, and left us alone there with the old man, her husband. He used to go into the woods all day and cut willow branches and make clothes pegs. Meanwhile, Micky – my little brother – came down because my mother was having another baby up in London. We never had a thing to eat, so we used to go to people’s allotments and pull up raw vegetables and eat them, carrots and even turnips. Once again, rebellion came to the fore, and I said to my brother and sister, ‘Come on, I’m going to walk back to London.’ It was only eighty miles. So, with what money we had, we bought some pears and we were walking up the road and we came to this little bridge and I thought, ‘I can’t walk all that way with these kids, they’re too little.’ I always had a little bag with me and I looked inside and found a stamped addressed envelope that my nan had sent me. 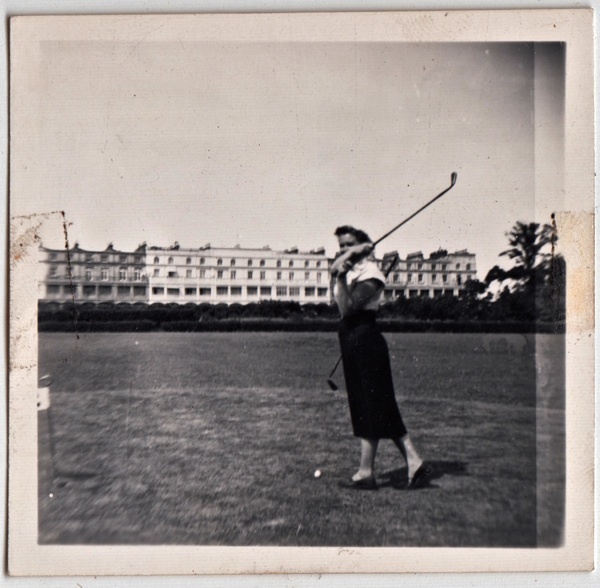 It was a Monday, the first day of the school holidays, and I sat down and wrote my tale of woe to my nan, and I posted it and said, ‘Let’s go back.’ And, as the week went on, we seemed to forget about things. On Friday morning, it was pouring with rain and we got up and came downstairs, and she’d cooked us a big bowl of porridge. She says to me, ‘You’ve written to your granny. You’ve got a letter, your brother’s coming down to pick you up and take you home.‘ I don’t think I ever felt as happy in all my life as I did that morning. Next morning was Saturday. We all got up, didn’t wash, and got all our things together and sat on the grass verge outside the cottage. Jimmy wasn’t on the first bus that came or the second and, by one o’ clock, I was beginning to think, ‘He’s not coming.’ We waited there all this time, and the old woman and old man never called us in to give us a drink or anything. The four o’ clock bus came and, all of a sudden, I looked up and there was Jimmy coming down the hill. He had a navy blue suit and a red shirt and his tie was blowing in the wind. I said, ‘We’re ready! We’re ready!’ He said, ‘I’ve got to let the lady know that I’m taking you.’ So he went inside and she said, ‘I’ve had a terrible time with those children.’ And he brought us back to London, and back to my dad and my mum who was in hospital having a new baby, Paul. So I went round to stay with my nan ’til my mum came home and I was beside myself with joy. And when I turned and looked at him, I fell in love with him. They say there’s no such thing as love at first sight but there is. I arranged to meet him the next night on the corner but, when I arrived, he wasn’t there – I didn’t realise he was on the other side of the road, waiting to see if I’d turn up. 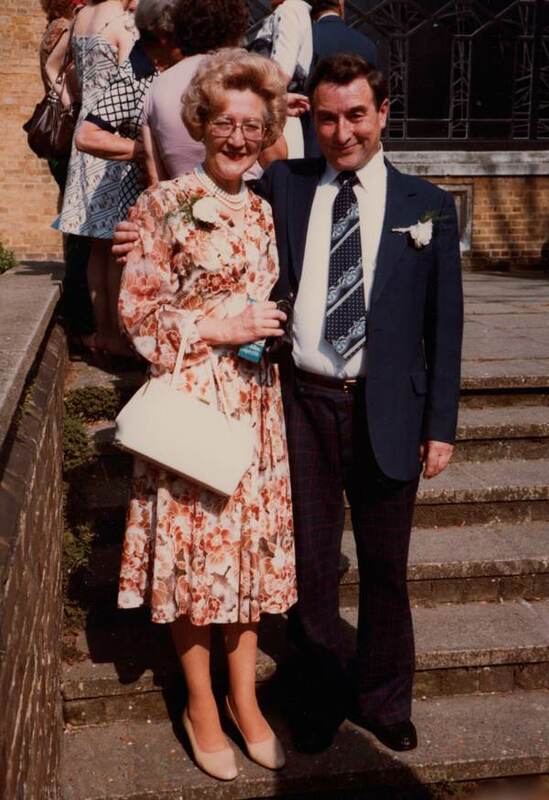 So I went back home and my mum was looking out the window, and she saw what happened and she said to him, ‘You’re later, young man!’ And we courted for four years because we couldn’t get anywhere to live and then we got married at St Dunstan’s, Stepney, on 1st August 1953. We got two rooms at the top of a block of flats, Dunstan House, Stepney Green. The toilet was on the landing and the sink too, but we thought it was our little paradise. Marie & Fred in their kitchen in Rectory Sq, Stepney. 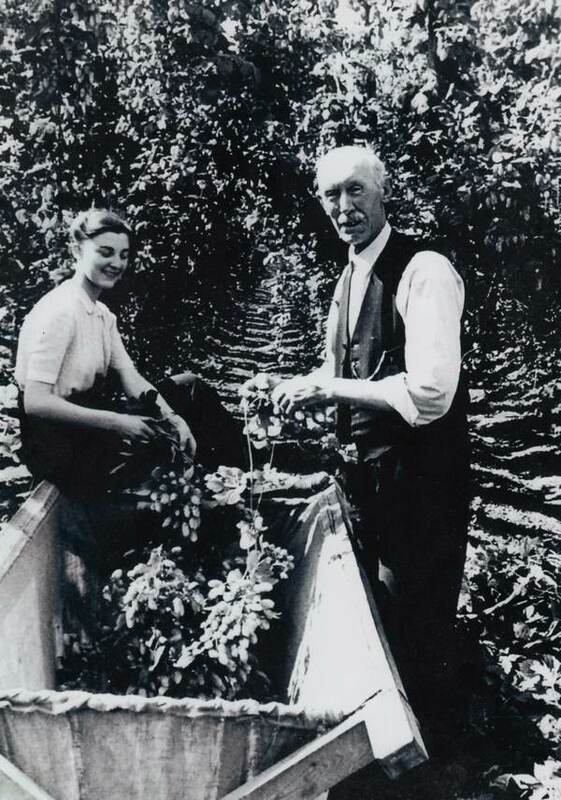 Marie’s sister Kitty, hop-picking with her grandfather after the war. Marie hits a hole in one. 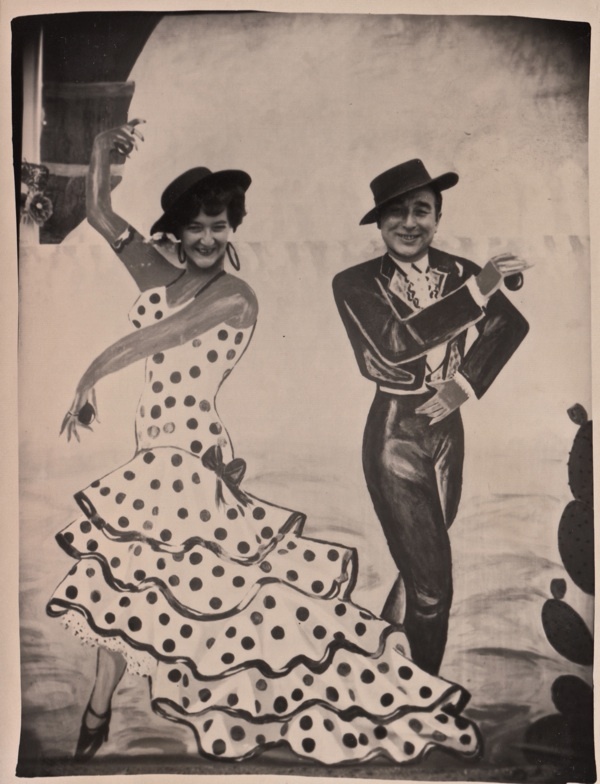 Marie & Fred go Flamenco. 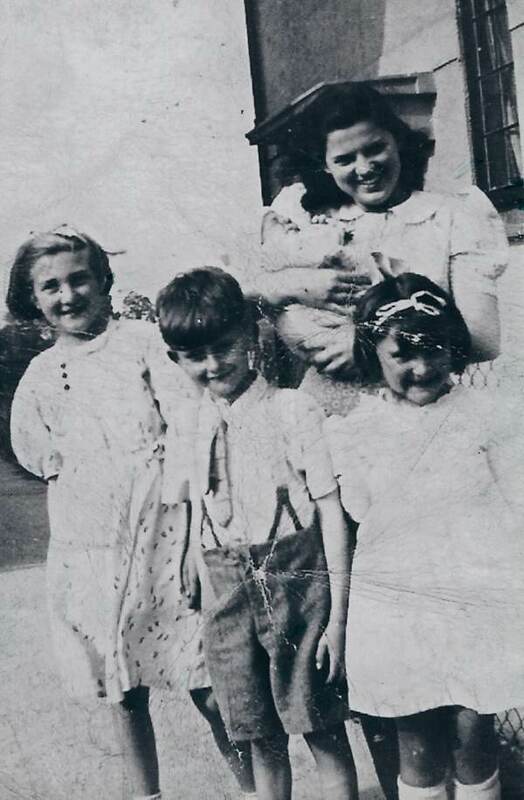 Kitty with her children, Marie and her mother in the fifties. 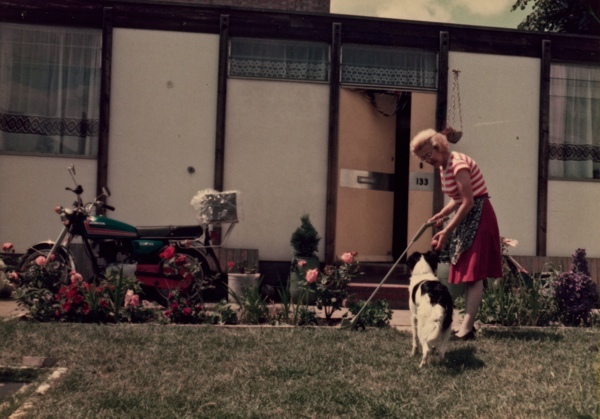 Marie and her dog Rufus when they lived in the prefab in Ashfield St.
Marie & Fred at a family wedding in the eighties. 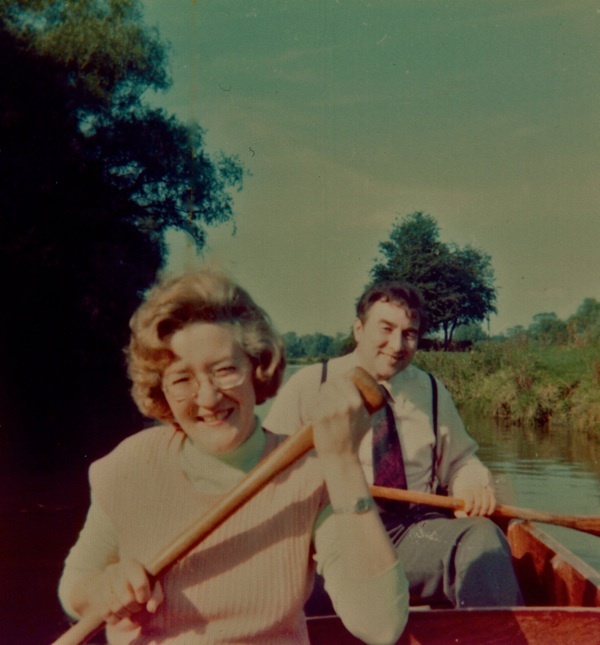 Marie & Fred enjoy an adventure on the river. 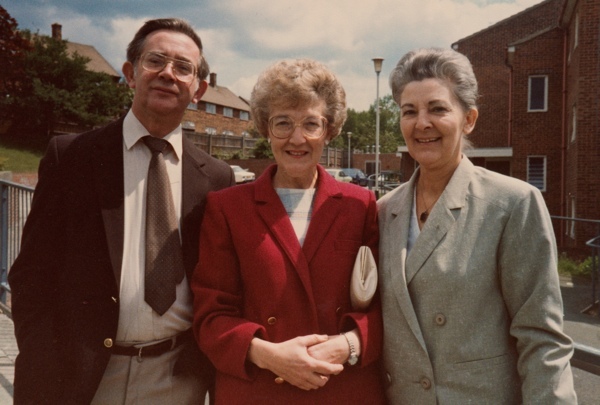 The three evacuees grown-up – Johnny, Marie and Kitty. 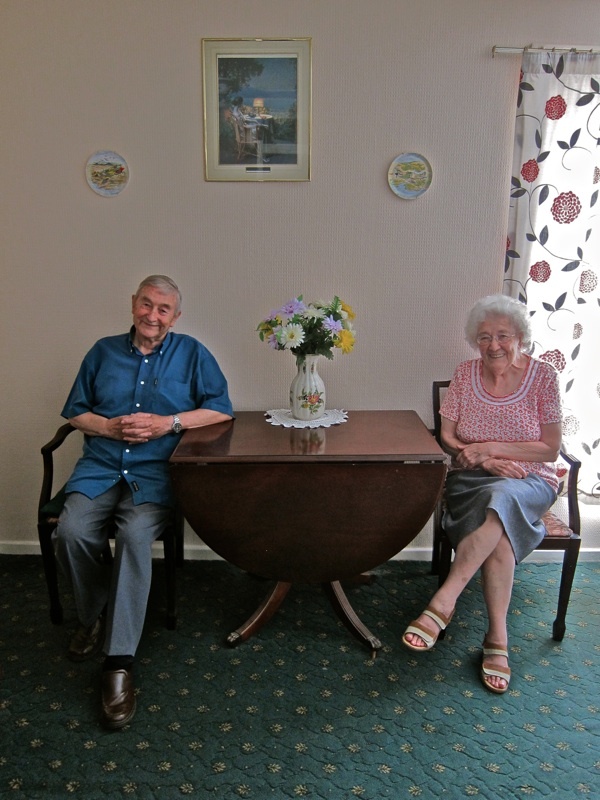 Fred & Marie celebrated their sixtieth wedding anniversary on 1st August 2013. It may be late but congratulations on your 60th wedding anniversary. What an enchanting story and funny too. Everyone has a fascinating story to tell. Of physiological damage done during those times. But I still have the love of my husbands parents. Wanted him back after it was safe for him to go back. My father and mother in law lived in Leyton. 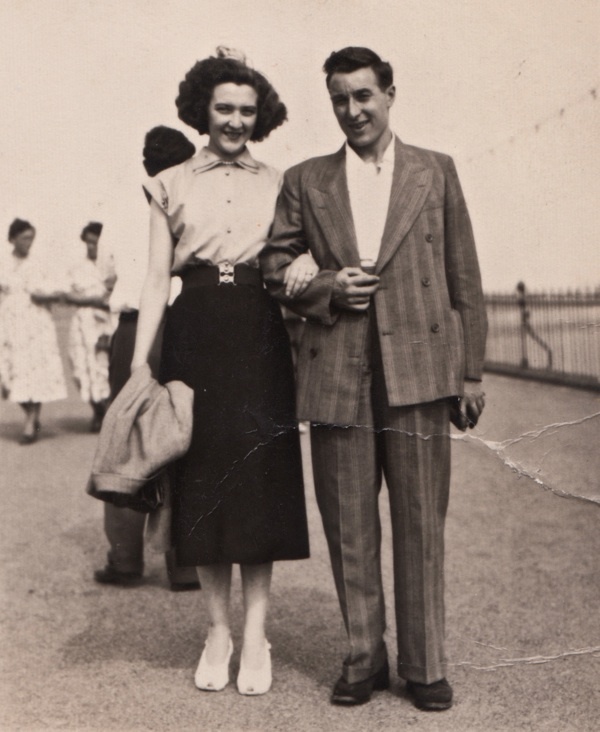 My mother and father were married on 1st August 1931, my dad died 2 months short of their golden wedding anniversary and my mother was most upset with him for being inconsiderate. She missed out on her message from the Queen; Fred and Marie obviously got their’s plus one for their Diamond. Lets hope they get their Platinum. A very impressing life story, affected by a wartime childhood. As that one from MY parents — celebrating their sixtieth wedding anniversary THIS year! I love these stories of people’s lives… Especially the ones about people who are near my age (I’m 77). A window on the world I grew up in, across the Atlantic — it’s like finding new pieces to a huge jigsaw puzzle. Thank you yet again for your wonderful work — I’m so glad you had the inspiration to undertake the challenge you set for yourself. I loved reading your story and seeing the photos. Such a touching story about being evacuated, made me a bit weepy. I’ve never been to Stepney but would love to see it now. Wonderful to hear Maries story, her lovely Cockney character shines through. What a wonderful story. 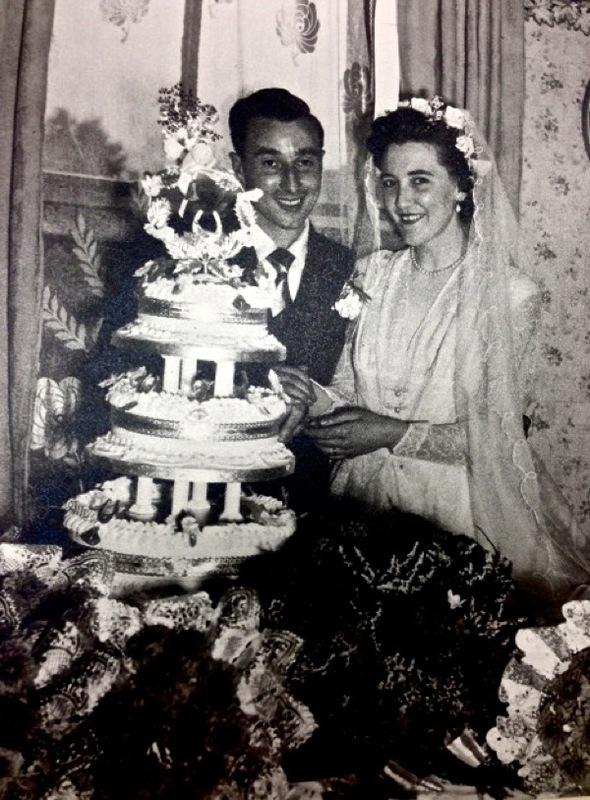 Belated congratulations on your 60th wedding anniversary, Marie and Fred. Thank you for sharing your story with the Gentle Author.